In response to complaints from residents, Phoenix and some other communities have ordinances intended to keep smoke shops away from schools. If a state lawmaker gets her way, all of Arizona will follow suit. Lisa Otondo, D-Yuma, introduced HB 2579, which would prohibit zoning ordinances that allow shops selling tobacco and smoking accessories within 300 feet of schools, playgrounds and day care centers. She said she authored the bill after one of her constituents complained about a smoke shop opening just across the street from Buckeye Elementary School in the West Valley. “It opened directly in front of the elementary school, with bongs in the window, right in front of the crosswalk where the kids walk by,” she said. George Diaz, government relations manager in Buckeye, said the city is already drafting an ordinance to limit the proximity of tobacco retailers to schools. He said HB 2579 would remove local control from cities. “In this case local control is probably more appropriate. It has to do with local leaders understanding what’s the best solution for their community,” Diaz said. He said there isn’t enough of a problem to warrant a state law. “It exists in one location in Buckeye, but other than that we’re not sure of how pervasive it is,” Diaz said. Ryan Levesque, deputy director of planning for Tempe’s Community Development program, said his city experienced a problem similar to Buckeye’s a few years back. Levesque said residents appealed several tobacco retailers’ permits to the City Council, one in particular being for a smoke shop near Tempe High School. “A lot of the residents had concerns with the perception that the smoke shop was trying to advertise to the children,” he said. Levesque said the city adopted an ordinance in 2007 prohibiting tobacco retailers from being located within a quarter of a mile of any school providing elementary or secondary education. He said smoke shops must meet this zoning requirement before they’re issued a retailer’s license. Phoenix City Councilman Bill Gates said Phoenix adopted a similar ordinance in 2012 after residents complained about smoke shops opening near schools. While existing retailers were grandfathered in, the ordinance prohibits new tobacco retailers from locating within 500 feet of a school, playground or day care. “We were hearing from the community, and people were saying, ‘Hey, what are you going to do about this?’ They were concerned particularly about the accessibility of these smoke shops to our kids,” he said. 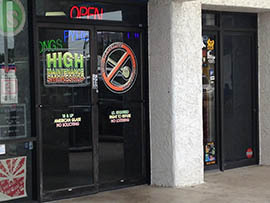 Gates said one of the shops receiving complaints was High Maintenance Smoke Shop, just a few minutes’ walk from Shadow Mountain High School in north Phoenix. Christopher Roberts, an employee at High Maintenance, said he always checks IDs before purchases and looks out for fakes, but he hasn’t found any yet. Alan Stephenson, director of the Phoenix Planning and Developing Department, said that despite the ordinance some parents complain that more should be done. “I think it directed the problem from the standpoint of a majority of neighborhood folks. But there are some that still would want a greater spacing requirement from kids,” he said. Candice Fremouw, parent of a student at Thunderbird High School in north Phoenix, said there are three smoke shops within walking distance of the school. “It’s a huge problem. And for the one closest to our high school, we have had other merchants in the area witness their sign spinners receive money from students and going in and making purchases for them,” she said. Fremouw said Phoenix’s limit of 500 feet is not far enough to limit this type of behavior. “That’s just barely one and a half football fields. To me, that’s not far enough away, and I’m concerned that they cluster,” she said. Brian Hummell, Arizona director of government relations for the American Cancer Society Cancer Action Network, said the standard be 1,000 feet. According to a study published in Preventative Medicine, schools with more tobacco retailers within walking distance have a higher prevalence of smoking. The report concludes that zoning restrictions would limit the amount of smoke shops near schools. HB 2579 received committee approval and was awaiting action by the full House. Otondo said she set the distance at 300 feet because there are charter schools located in strip malls, where smoke shops may be located. But she said there are plans to add a floor amendment increasing the distance to 1,000 feet. “There is already in existence a thousand-foot ordinance for the drug-free zone in any direction of a school. So maybe we can be able to run it,” Otondo said. She said the bill provides exceptions for small stores where less than 15 percent of the floor space is dedicated to selling tobacco products, and any smoke shop already within the prohibited distance would be grandfathered in. 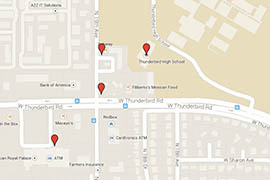 A interactive map of smoke shops near Thunderbird High School in Phoenix. This smoke shop a few minutes’ walk from Shadow Mountain High School in north Phoenix has been the focus of complaints from some area residents. A state lawmaker wants to ban smoke shops from within 300 feet of schools, playgrounds and day care centers.